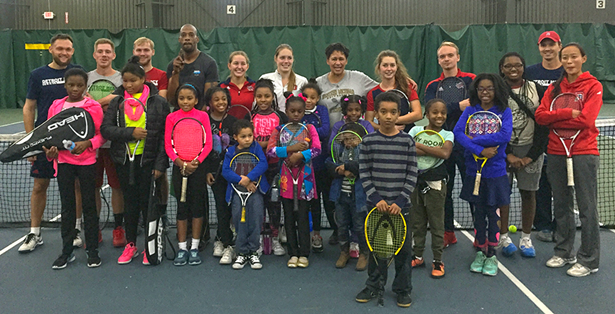 The University of Detroit Mercy men's and women's tennis teams have been busy in the local community this winter, most recently with the Palmer Park Junior Tennis Academy. The Titans joined the youth tennis club in December and January for individualized sessions and group training activities for children of various ages and skill levels from the Detroit community. "Our whole purpose was to support the Detroit tennis community," said head coach Aaron Paajanen. "Coach Leonora King and Jerry Wysinger are so passionate and it means a lot to our program and our student-athletes to get out there and be involved with the local coaches, junior players and younger kids." The Palmer Park Junior Tennis Academy was established in 2011 as part of the People for Palmer Park non-profit organization. The group operates year round, giving young tennis players in the Detroit area the opportunity to receive instruction and grow their tennis skills. The Titans will return to the court and prepare for the upcoming season, with the men starting this weekend at Western Michigan and the women's side getting underway Jan. 27 at Western Kentucky.